In Miami, the temperatures are pleasant year round. The best time to visit Miami is from November to April. During these months, the temperatures are moderate, and rainfall and humidity is lower than in the summer months. This brings about a much more bearable and comfortable atmosphere in which you can enjoy your holiday. 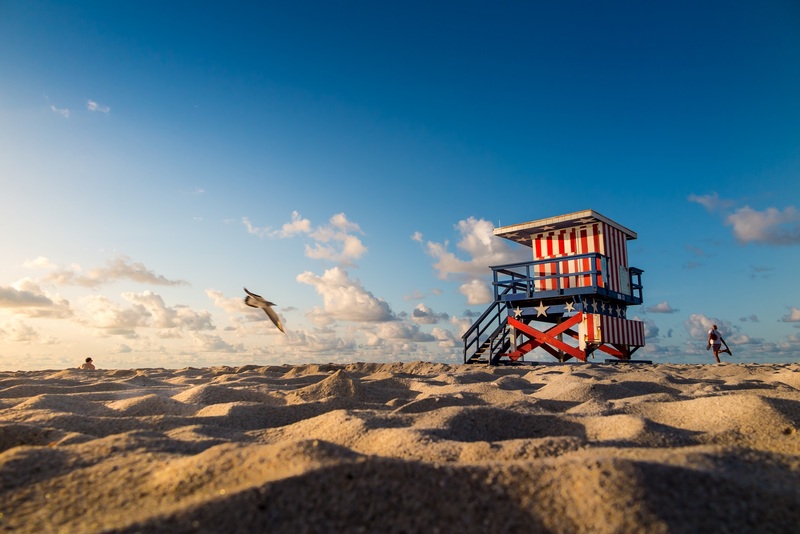 Even though summer in Miami falls during The main season in Miami is between the months of March to August, when it can reach up to 33° C. If you’re not put off by hot and humid days and the possibility of rain, then summer is the perfect time for your trip to Miami. Between February and the middle of April, spring break parties are common across America. Miami is no different, and each year thousands of students flock to the city to celebrate and to party. If this is too much for you, then perhaps it’s best for you to avoid the city at this time. When is the best time for a beach holiday to Miami? When is the rainy season in Miami? When is the dry season in Miami? How long does the hurricane season in Miami last? More than six million holidaymakers choose Miami, Florida’s most famous city, each year. This metropolis on the Atlantic coast scores highly, with miles of beautiful beaches, a vibrant nightlife, and countless attractions. The latter includes the Cuban district of Little Havana, an offshore island of Miami Beach, and the Art Deco District. Just a few miles away from Miami lies Key Biscayne Island, which is a great spot for an unforgettable trip out of the city. I also really recommend the Everglades National Park. Be sure you’ve got all the up to date info on the weather in Miami, so you don’t walk into a heatwave or are rained upon for your whole trip. Remember as well that there’s a rainy season and a dry season in Miami. As well as all this, some months are in the hurricane season. In this article, I’ve got all the tips on the best time to visit Miami. I’ve included a handy chart to show you when the best and most pleasant temperatures are found, whe to expect rain, and in what months the sun shines most. The warm climate of the Atlantic coast attracts many thousands of tourists to the Sunshine State – Florida, because an unforgettable beach holiday is almost guaranteed here. Miami’s most popular beaches include Miami Beach, Key Biscayne, South Beach and Bal Harbour. The turquoise waters of the Atlantic Ocean are warm and welcoming all year round, but if you’re looking for sunshine the best months are between April and July. During these months the sun shines the longest, averaging about 10 hours a day. Water temperatures are also at around 25 to 30° C. Be warned, rainy season is between May and October. You should expect rainfall in the afternoon, and humid air. January: 24°C, 7h sunshine, 5 rainy days, 22°C water temperature. February: 25°C, 8h sunshine, 6 rainy days, 22°C water temperature. March: 26°C, 9h sunshine, 6 rainy days, 23°C water temperature. April: 28°C, 10h sunshine, 6 rainy days, 25°C water temperature. November: 27°C, 8h sunshine, 7 rainy days, 26°C water temperature. December: 25°C, 7h sunshine, 5 rainy days, 24°C water temperature. Miami has a tropical monsoon climate. Due to the year-round warm climate, there are no classic seasons. Instead, the year is divided into summer and winter. Summers are damp and hot, while winters are dry and warm. The high temperatures in summer are due to Miami’s low altitude, and the Gulf Stream also has an impact on Miami’s climate. It prevents extreme heat, and also strong, cold waves. The differences in temperature between summer and winter are relatively small. In January, the maximum temperature is 24° C, and this rises steadily throughout the year. It reaches its peak in August when the thermometer hits 33° C. The coldest months are January and February, with minimum temperatures of 15° C. No snowfall is expected in any month of the year. Humidity is high in summer compared to the winter. Miami is in Florida, which is known as the Sunshine State. So, as this name suggests, holidaymakers should expect at least seven hours of sunshine a day. This minimum value is found in January and December. February and November have an average of eight hours of sunshine a day, while March, August, September and October will get nine hours of sun. From April to June, the sun shines for 10 hours every day. Rain values, on the other hand, are different. The least rain falls in January and December, with averages of five rainy days in these months. Between February and April you can expect up to six rainy days. From May, the number of rainy days rises to nine, reaching a peak of 16 days in August. In September, rainfall drops again. The water of the Atlantic is pleasant year round, with temperature fluctuations of nine degrees on average. The minimum temperature in January and February is 22°C. In July and September the water temperatures hit about 31°. The Atlantic Ocean is at its warmest in August at 31°C. But, swimming is pleasant even from a temperature of 22° C, which is what you should expect in Miami all year around. So, it’s possible to have a great holiday in Miami in any month. The rainy season in Miami lasts from May to October. This overlaps with the hurricane season. During the rainy season, monsooon-like rains may occur. May has an average of nine rainy days, and the number rises steadily in June and July. Rainy days reach their peak in August, with an average of 16 rainy days this month. From September, the number of rainy days drops again. September has 14 rainy days, and October gets 11 rainy days, which still qualifies it for the rainy season. Rainfall is especially common in the afternoons, and flooding is not uncommon. However, this period also has the most sunshine throughout the year. The heat, combined with the high humidity that is common for summer, can make it an uncomfortable experience for many tourists. The dry season in Miami is from November to April. These months have significantly less rainfall than in the rainy season. The maximum is in November, with seven rainy days throughout the month. January and February are the driest months, with an average of five rainy days. From February to April, the rainy days per month increase by just one. During the dry season, the sun shines between seven and 10 hours per day. Officially, the hurricane season in Miami lasts from the beginning of June until the end of November. Often, tropical cyclones form even outside these months. Most, however, happen between mid August and the end of September. Throughout the hurricane season, holidaymakers should expect strong storm gusts. High rainfall and flooding can cause some serious damage to the city. Miami, along with New York City and New Orleans, is one of the most vulnerable cities for hurricanes in the US. But, a hurricane doesn’t hit the city every year. More often, the city is affected by thunderstorms, high rainfall, and slightly lower temperatures. The last hurricane to hit Miami was in September 2017. Hurricane Irma caused the worst destruction to the city since Hurricane Wilma in 2005. But, if your trip falls in hurricane season, don’t be worried. Hurricanes are closely monitored in Florida, and early warning systems are really reliable. If a dangerous situation occurs, all citizens and tourists in Miami will be informed in good time, and will be evacuated if necessary. Detailed climate forecasts can be found on the National Hurricane Center website. Despite the high humidity and the increased chances of rain, summer is still the peak tourist season for Miami. Though the summer months are in the hurricane season, you can also expect a huge volume of tourists in the city. Prices for flights and accommodation can also be quite high in the city during the summer months. In terms of climate, the best time to visit Miami is from April to November. In these months, the city experiences its dry season, and it’s the optimal weather for a holiday to the south eastern Florida city. Temperatures are pleasantly warm, and it rains a lot less than in the summer months. GuruTip: April has similar values to the summer months, and the rain probability is a lot lower. Planning a tour of Florida? Then I really recommend you to plan a trip to the Everglades. The southern Florida Keys and Fort Lauderdale are also excursion destinations definitely worth seeing in the Sunshine State. If you plan on bringing your kids, why not go for a visit to the world famous Disney World theme park in Orlando? Have you got travel fever? What happens in Vegas, stays in Vegas! Read up on essential weather info here. Discover the best time to visit both New York City and the Niagara Falls!